USDA Certified Organic Canola Oil, an ideal oil for all types of cooking. Canola Oil is low in saturated fast and contains both omega & omega-3 fatty acids in a rato of 2:1. Being rich in omega-3 fatty acids, it has a positive impact on health. Ingredients: 100% Organic Canola Oil. $10.99 Notification will be sent to your e-mail address every time the item price is decreased. Ghee is the most popular cooking medium in India. It is made from purified butter with the water content boiled out - giving you a flavorful cooking medium that can be used in the same way as regular butter or cooking oil. Ghee does not require refrigeration as long as no water comes in contact with the Ghee. 24 Mantra Organic Ghee is made from 100% organic butter (made from non-homogenized whole milk from grass-fed cows). No GMOs, no added salt, no preservatives, no trans fat. $18.99 Notification will be sent to your e-mail address every time the item price is decreased. An expeller pressed mustard oil with a pungent and nutty flavor with a high content of anti-oxidants and cholesterol reducing properties. 24 Mantra Organic Mustard oil is also a double filtered, unrefined oil. Mustard oil has been used for cooking for centuries in India and is popularly used in pickling. Please note: Due to US FDA regulations, all mustard oil imported into the US must be labeled "For External Use." An expeller-pressed, pungent and nutty oil with high content of anti-oxidants and cholesterol reducing properties. 24 Mantra Organic Peanut Oil is double-filtered and unrefined. Ingredients: Organic groundnut seed / peanut oil only. $12.99 Notification will be sent to your e-mail address every time the item price is decreased. USDA Organic certified Sunflower Oil, an ideal oil for any type of cooking. 24 Mantra Organic is India's leading organic food brand. Their products are sold throughout the world. Ingredients: 100% Organic Refined Sunflower Oil. 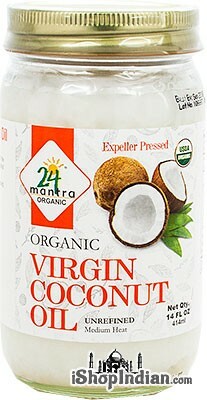 24 Mantra Organic Virgin Coconut Oil is a Raw and an Unrefined food product. This oil is crafted in compliance with USDA organic standards using fresh coconuts and our process is carefully temperature controlled to ensure that the coconuts are never heated above 115 Fahrenheit. Our unique temperature controlled oil pressing technique allows us to retain the natural antioxidants and the healthy fatty acids such as Lauric acid found naturally in coconuts. From growing the coconuts to pressing the oil, our process does not use chemicals or solvents. When cooking or baking, use as a substitute for butter or margarine. As a topping on bread or toast, as an addition to your smoothies, or as a cooking oil, our organic Virgin coconut oil is a delicious and a nourishing organic supplement that will enhance your well being. Also a natural oil for skin and hair care and massage. Ingredients: 100% Organic Naturally unrefined and Raw expeller pressed virgin organic coconut oil. Note: Virgin Coconut oil is solid and opaque at room temperature and becomes clear at temperatures above 75F. An expeller pressed mustard oil with a pungent and nutty flavor with a high content of anti-oxidants and cholesterol reducing properties. Mustard oil has been used for cooking for centuries in India and is popularly used in pickling. Ingredients: 100% Brassica Nigra (Mustard Seeds) Extract. Allergy Advice: The Product was processed on machine that also processes Peanuts, Tree nuts and Sesame seeds. Precaution: Avoid areas close to the eyes and other sensitive areas. Storage: Store in Cool & Dry place. This artisan quality, small batch Pure Organic Ghee is truly special, and made with great attention to detail. They start with organic butter from grass-fed cows never exposed to pesticides or hormones. They then produce this ghee using traditional Ayurvedic methods. It is slow cooked on an open flame in small batches to remove water and milk solids from the butter and produced in a mantra infused kitchen powered by solar electricity. The ghee is produced on a small, homely farm right here in the USA. An cold-pressed mustard oil with a pungent and nutty flavor with a high content of anti-oxidants and cholesterol reducing properties. Ingredients: Cold Pressed Organic Mustard Seed Oil. Sesame oil from cold-pressed organic certified sesame seeds. Sesame seed oil is one the healthiest oils for cooking and is popular throughout India and Southeast Asia. Ingredients: Cold Pressed Organic Sesame Seed Oil. Ghee is clarified butter with hints of nutty, caramel flavors. Ghee has been a staple of many culinary traditions around the world for centuries, and today it’s prized for its rich buttery taste, enticing aroma, and its high smoke point, which makes it ideal for high-heat cooking. 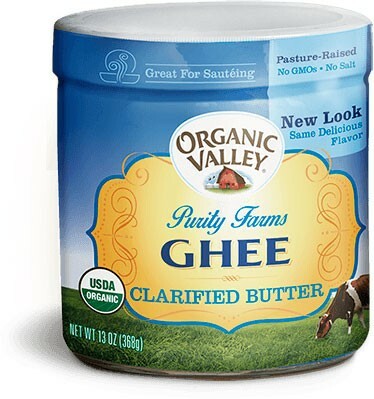 Organic Valley Ghee slowly simmers their clarified Ghee to coax the excess water out while preserving the nutritional benefits of pasture-raised organic butter. In the process, some of the Ghee’s milk solids will caramelize, leaving behind hints of sweetness and roasted nuts. Ghee is a lactose-free, casein-free, and shelf-stable product. ALWAYS ORGANIC: Absolutely NO antibiotics, synthetic hormones, toxic pesticides or GMO anything. STORAGE AND HANDLING: Store in a cool, dry, dark place for optimal flavor. Keep capped when not in use. $15.99 Notification will be sent to your e-mail address every time the item price is decreased.